5 Picks from The Wired 40; NVIDIA helps us visualize…. We start by looking for the basics: strategic vision, global reach, killer technology. But that’s not enough. an impatience to put them into practice. The top 3 companies for 2006 are Google, Apple and Samsung in that order. I wanted to highlight 5 others on the list that seem like good things will happen for them based on societal trends. This is my top 5 wired subset list from a NON investor. NVIDIA – Wired Rank 21 – These folks make graphics cards. Really good graphics cards. With the growing importance of visualization of information. Open source usually lags in innovation behind private companies (oh shoot me). We all need dual monitors with great graphics. Betting on NVIDIA is easy. GENENTECH – Wired Rank 04 – how can you go wrong with customized drugs for specific patient groups. Marketing teaches us that markets diverge, not converge. So we need drugs for divergent humans. Evolution, eh? LI & FUNG – Wired Rank 32 – outsource production of clothes for major brands. If there is anything I learned from reading on marketing and then Jane Jacobs it is that first you outsource, then innovate, then export. They either grow through the brands themselves, or innovate and become the brand. Either way it sounds like they are in the driver’s seat. to them to mess it up. I don’t think they will. Now we just need to figure out the nanotech battery companies that power the dewalt drills. 18 VOLTS! Put that in your hybrid. The demos of demographic profiling of search on adlab site of adcenter search technology. The image to the left demonstrates the end result; you get gender approximations based on search term. These are estimated from the behavior of the user I am guessing from total search patterns. So, hypothetically if a searcher is obsessed with someone perhaps this indicates a male behavior. That profile data is tied back to search terms and presented to the marketing team as such. Interesting. All kidding aside, I do see real value in demographic data when formulating strategy for clients. This does matter. Note that Google only released google trends after it was obvious that technorati and blogpulse visual reporting was skyrocketing in use. Perhaps this will lead to a similar disclosure from adwords or overture in the future? Privacy? That is another matter. Mark Cuban, by default, accomplishes what tons of PR people TRY to accomplish. He does it unconsciously. What is that? He is brutally honest and genuinely interesting which makes him Brangelina. (his words) More? I’m sorry for what I make you cover. In my naive days I used to think that news stories were meant to be stories of interest. That they were uncovered topics that were being revealed to a public thirsting for information and knowledge. Now, Im coming to realize that there is something more to how stories are selected. Im just not quite sure what that “something “ is. It is perhaps a bit disingenuous to suggest that you don’t understand how being a dot-com-millionaire-loud-sports-fan-nba-owner makes you newsworthy. Hmmm. Personally I’d rather read about Mark in the news than Brittney or Brangelina any day. Keep up the "something" Mark! RELATED: Mark Cuban photo selected from flickr because it is set up with a creative commons license. If you aren’t familiar with CC it is worth reading up on. Give away some content and you will get linked. And THANKS SDK for the use of the photo! Watched the video on bumptop from the link on 43 folders. Bumptop is a new desktop interface prototype. Many of the user interface metaphors are similar to a real (physical) desktop; moving files around, stacking, shuffling things. The critique on 43 folders, linked above, addresses several of the limitations. On the PLUS side, the "zip" motion of circling and drawing a line through the middle is innovative. I can see using that interface in favor of the CTL-CLICK-CLICK-CLICK method I currently use. Circle, zip through the middle, post to flickr. Easy. The biggest missing component is an increased utilization of horizontal adjacency. I have mentioned this before in a post on Open Crouquet. Two recent finds in the area of online journalism. paves the way for people to build communities with ever greater ease. people that are changing the world, when they are heard. I predict OhMyNews will have a significant impact globally as a counter point to cnn.com. The second interesting news web site that was pointed out to me is NEWSEUM which includes links to "Today’s Front Pages". As the name suggests, it is an interactive museum of news. It strikes me that this is also a great way to see what stories are running in different parts of the country. The picture at the top right is the Ventura County Star – chosen randomly from the Newseum site. Next Tuesday Refresh Houston will be meeting and I get to be the speaker. yea! OK, seriously, this is a more technical audience and I wanted to cover two technologies that are very important for the future. Kelsey indulged me so I wanted to review CAPs and PFIF (links below). creators and advocates help before it is too late? with and use them smoothly BEFORE a crisis hits. millions through technology and a little forethought. A shout out to David Guilhufe of Civic CRM who introduced me to PFIF through netsquared.org. Cost-Per-Action Advertising for Survey Promotion? The Google AdSense team would like to invite you to test a feature that provides you with a new way to earn revenue from your website by hosting ads that are compensated based on a Cost-Per-Action [CPA] basis. My first thought was – sure you could use that for affiliate marketing, but Cost-Per-Action would also be a great low cost way to drive completed surveys. I like the microwork concept from mturk but that is such a small subset of people. PPC for surveys is problematic because most people do NOT want to take a survey when seeking something. They want to find something at that point. But I believe an image marketing type ad soliciting survey completion without any direct compensation to the respondent might produce a balanced result. File this under "to be tested." Define organization borders by actors, relationships and activities. A focus on relationships or activities emphasizes behavioral criteria for defining the limits of organizations. Since both interactions and activities require time and space, two useful indicators of significant boundaries are an organization’s spatial barriers and their guardians (e.g. fences, walls, doors, guards, receptionists) and their temporal systems (e.g. working hours and activity schedules) it creates to contain them. Surely that section would have to be rewritten with the advent of blogs and myspace. How do you define borders in a world without guardians or temporal systems? One more reason that while it is important to study history, not everything applies directly. Thanks for making us think Steve. Someone just linked me Kiptronic along with a question. Apparently Kiptronic handles podcast advertising. This matters because most talent for podcasts isn’t really all that focused on selling ad space. And if they do sell advertising, who is going to do the production of the "bumpers" at the front and/or back of the show? Hence the need for a third party to handle advertising. I do like the stated policies via faq which seem fair to the content producers. 2. Do I have to give up any ownership rights to my podcast, or sign a long-term contract? Please note, I have not had any experience directly or through a client with these folks. If anyone has had any experience with Kiptronic or can recommend a better podcast monetization strategy (without selling your soul) please DO let me know. I have a client asking about it. Is this a Web Analytics Blog? Can’t I Just be a bit Confused? Thanks to Occam’s Razor by Avinash for ranking this one of the top web analytics blogs. I didn’t particularly think of this blog that way. Then I scrolled through a few of my past posts and found the one on keywords in state of the union addresses. Perhaps the geekiest political post I have ever done. Eric’s post on the web analytics subject is also a fair critique. Including the comment that this blog wanders around on numerous topics. I liken it to the introduction in Freakonomics (not that I am anywhere near that talented – please don’t interpret this comment that way!) where they say he has "no unifying theme." Interesting but no unifying theme. That is my goal. Interesting. Last but not least, I am finally back in Houston after visiting San Francisco, Oklahoma City and Little Rock on biz stuff. Tons of new photos on flickr for those who like eye candy. This photo in particular reminds me of how lucky I am. Happy Fathers day folks! HitTail – Web Analytics from a PR Firm? The HitTail site has an 8 minute demo (sorry, 8 minutes is a LOOOONG TIME!). From viewing the demo, it looks like Google Analytics with a clear visualization of more than your top 25 inbound search words. UPDATE: Please see the comments section on the latest from HitTail! Humans in the machine – spoken by many speakers at ETECH over the last few years. This means that what is interesting is the humans. Not the computers. The computers are just aggregating content from the humans. And content doesn’t just mean something you wrote. Viewing something, voting for something is content when gathered together and acted upon. Think tagging. If you use the Internet you are adding content. Join the conversation – if you don’t take a seat at the table, when you ARE interested in what they are saying you won’t have any credibility. Join the conversation now. It is fun. And then if you need to respond you have a voice. Lose the speaking points and point to people who are saying something you agree with. Point more. Link love is good. YES-AND – use the rules of improv comedy. Don’t try to fight what people are saying. Yes-AND blah in your response. Be positive but do tell us what you are thinking. "Yes I realize you hated that post, and I can see your point. It was intended to …." and go from there. Yes AND – like improv comedy. The screen shot at the top right illustrates my point. That is the new Netscape beta page. The geeks voted up two articles of the top three that are critical of AOL. That is influence and people talk about it. Join the conversation. Taylor Cole and Michelle Smith opened PR Day in OKC with "Strategic Media Messaging and Training for a Buzzed and Blogged Millennium." The session was very actionable including video interviews and feedback. Thanks again for the invitation Danielle! Inspired by Media Orchard’s post on readability, I have been talking to numerous folks in PR about the Gunning Fog index. Using this tool to measure readability. I really don’t specifically mean that exact test only. I am just asking what level of communication we should use when communicating. John Updike or Dr. Seuss. As for me, according to Scott this blog is a 9.02 while Media Orchard is 7.70. His blog readability measurements are interesting. In this case a lower score is better so Scott wins. On the other hand he IS a freaking professional communicator so I should get some wiggle room, right? On to constructive thoughts that relate. I am giving the keynote (yea, go me! ok, whatever Ed….) for PRSA OKC tomorrow. The picture above was a wonderful dinner which I greatly appreciated. Now, there I was with 7 PR professionals in leadership roles so OF COURSE I brought Gunning Fogg up. A quick shout out to three great new blogs that I read. I know these folks IRL but I definitely enjoy their voice! Galagagal – Lauren’s online voice. I have worked with Lauren for a few years now. Amazing. If direct at times. <grin> And her flickr account is growing rapidly! Try not to worry about the scary drawings on that one post. KTT – the problem with names is that if you don’t come up with one, someone else will give you one. Given there are two Katie’s at the office, well, this is the one whose last name starts with a T. Great comedic and entertaining writing. Especially since I know it is REAL! I do worry about KTT and her friends with cell-phone liquidity-problems. This is a geek specific post. That is my audience for just this post. If it doesn’t make sense please just skip to the next one. In my post to answer the four questions on the NetSquared site I stated that language was one of the obstacles. That we use too many funky words. And this post is proof. Geekdom aside, here are a few relevant links on what the folks back in Houston are doing. And I am sure that Marc contributed based on the email threads. Trouble maker that one. Of course a special thanks to Katie for covering me while I was off playing working at the AAF conference. The picture with this post? Absolutely nothing to do with NetRefreshBarSquaredCamp. It is Hans Haacke Blue Sail from SF MOMA. I took the SF MOMA pictures yesterday so I was thinking about it. Nice eye candy. Eisenbergs: Waiting for Your Cat to Bark? Brian Eisenberg and Jeff Eisenberg’s new book is out. Waiting for Your Cat to Bark is available now. 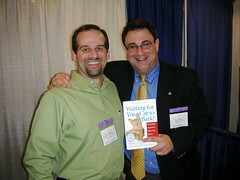 That said, the picture to the right is of Javier Avellan taken with Jeff at the AAF conference this week in San Francisco. Also, if you haven’t read Call to Action also by Future Now Inc I recommend it. At least if you are in advertising or marketing. When I get done with Waiting for Your Cat to Bark I’ll post a follow up. Disclaimer – they are Tendenci clients through The Web Analytics Association. But that isn’t why I posted this. Jeff did a SOLD OUT presentation at AAF last week. Complete with no AC and everyone still stayed. That good. Emphasis added by me. It is interesting to note. I took the picture at left yesterday near the hotel. It is called "Passage" by Dan Das Mann and Karen Cusolito. 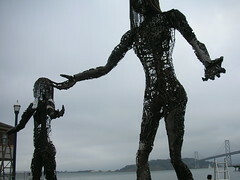 It is being installed on the Embarcadero near the Bay Bridge in San Fran. A project of the Black Rock Arts Foundation. This will be a crazy week, three nights in San Fran, then OKC for one night to give a talk, and then on to Little Rock Arkansas for another one. I promise not to say anything about Wal-Mart. Hmmm. Specifics after the jump.